Brian Matthew Krzanich (born May 9, 1960) is an American engineer and businessman currently serving as the chief executive officer of CDK Global. 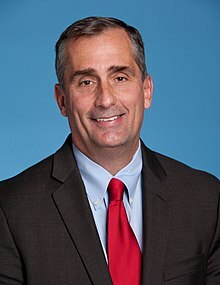 He served as the CEO of Intel from 2013 until his resignation in 2018, following revelations of an extramarital affair with a subordinate. He joined the company as an engineer in 1982 and served as chief operating officer (COO) before being promoted to CEO. As CEO, Krzanich was credited for diversifying Intel's product offerings and workforce. Krzanich has served on the Deere & Co. and Semiconductor Industry Association boards, as well as the Drone Advisory Committee, which advises the Federal Aviation Administration. He resigned on June 21, 2018, after a past consensual relationship with a subordinate against company policy came to light. Krzanich is from Santa Clara County, California. He graduated from San Jose State University in 1982 with a bachelor's degree in chemistry. Krzanich began working as a process engineer at Intel's chip factory in New Mexico in 1982. He became manager of a fabrication plant in Chandler, Arizona, in 1996, and later supervised assembly and testing facilities. He held management roles within Intel's manufacturing division, managed a plant in Massachusetts, and began overseeing the company's factories and supply chains in 2007. Intel removed conflict minerals from its microprocessors while Krzanich was in charge of the company's supply chain. He cited moral obligation as the reason to take action, and said the issue was "very important and personal" to him. Intel worked to use conflict-free minerals for all microprocessors by 2014 and all products by 2016, and Krzanich was included in the documentary film Merci Congo (2016). In January 2012, Krzanich was promoted to the role of chief operating officer. He led Intel's China strategy in this role. Krzanich served as chief executive officer (CEO) of Intel starting in May 2013. In this role, Krzanich has been credited for expanding Intel's offerings beyond central processing units (CPUs) and into other technologies, including 5G wireless networks, artificial intelligence, autonomous vehicles, cloud computing, drones, and wearables. Intel has also explored artificial, augmented, and virtual reality, as well as machine learning, during his tenure. In January 2015, he announced Intel's $300 million Diversity in Technology initiative to support the company's goal to achieve full representation of women and underrepresented minorities in Intel's U.S. workforce by 2020, and accelerate diversity and inclusion across the technology industry at large. These activities include funding engineering scholarships at historically black colleges and universities, establishing a professional gaming women's team, and sponsoring female students to attend game developer conferences in partnership with the International Game Developers Association. In addition to Intel's Diversity in Technology initiative, the company's Hack Harassment campaign has worked to address cyberbullying with Krzanich as CEO. In January 2017, Krzanich spoke out against Executive Order 13769, U.S. President Donald Trump's executive order banning entry into the country by residents of seven predominantly Muslim nations. In February, he stood alongside Trump at the White House to announce a $7 billion investment in a new factory in Chandler. The announcement was made one day after Intel and other companies told a court that they believed Trump's immigration order was unconstitutional. Krzanich also expressed support for the president's regulatory and tax policies on behalf of Intel. Krzanich supported transgender rights before and after Trump announced the reinstatement of the ban on military service by transgender individuals in July. In August, Krzanich became the third executive to leave the Trump administration's American Manufacturing Council in 24 hours (following Kenneth Frazier and Kevin Plank, the CEOs of Merck & Co. and Under Armour, respectively), based on the president's response to the Unite the Right rally. In a blog post confirming his resignation, Krzanich said "promoting American manufacturing 'should not be a political issue'". He and other CEOs in the technology industry called for legal protections for "Dreamers", or immigrants who arrived in the U.S. as children, after the Trump administration rescinded the immigration policy known as Deferred Action for Childhood Arrivals (DACA) in September 2017. Krzanich's involvement in politics and Intel's diversity initiatives required the company to increase personal security funding for Krzanich and other colleagues because of received threats. He has made personal political contributions through Intel's political action committee. In November 2017, Krzanich exercised stock options and sold shares in Intel worth $24 million after the company had learned that all its chips sold in the last decade had a major and fundamental security vulnerability. When the news became public in January 2018, the timing of the sale was questioned. Krzanich retained 250,000 shares, the minimum amount allowed under his employment agreement and approximately half of the 495,000 shares he held prior to the transaction. In June 2018, Krzanich resigned as CEO of Intel after an internal probe found that he had engaged in a consensual relationship with a subordinate, which Intel said violated its anti-fraternization policy. According to various news outlets, the extramarital affair began before the enactment of the anti-fraternization policy and ended several years before his resignation. On November 7, 2018, Krzanich was announced to be the new chief executive officer and president of CDK Global, replacing former CEO Brian MacDonald. Krzanich has served on the boards of the energy company Lilliputian and the Semiconductor Industry Association (SIA), for which he also served as the elected chairman in 2015. He was elected to Deere & Co.'s board of directors in January 2016. He was appointed chairman of the Drone Advisory Committee, which offers recommendations to the Federal Aviation Administration, in May 2016. Krzanich has been married to Brandee Krzanich since 1998. They have two daughters, with whom he has attended hackathons. In June 2016, Krzanich canceled an event at his home in Atherton, California, that was reported by the New York Times to be a fundraiser in support of Trump. According to Intel, the event was intended to be "a full exchange of views," but it was widely seen as incongruous with Intel’s support for immigration reform, Intel's US$300 million effort to attract women and minorities, as well as detrimental to the company’s interests in China, the biggest market for the semiconductor industry. Krzanich later said he would not endorse a candidate in the U.S. presidential election. ^ "Кто такой Брайан Кржанич, новый директор Intel?" (in Russian). Retrieved 2018-01-05. ^ Clark, Don (June 21, 2018). "Intel C.E.O. Brian Krzanich Resigns After Relationship With Employee". Retrieved 2018-10-17. ^ a b c Morrow, Brendan (February 8, 2017). "Brian Krzanich: 5 Fast Facts You Need to Know". Heavy.com. Heavy Inc. Retrieved September 8, 2017. ^ a b c d e Randewich, Noel (May 3, 2013). "Run silent, run deep: The life of Brian Krzanich at Intel". Reuters. Retrieved September 7, 2017. ^ a b c "Intel CEO elected to Deere & Co.'s board". Quad-City Times. Davenport, Iowa: Lee Enterprises. January 5, 2016. Retrieved September 11, 2017. ^ "Job Maestro: How to Be the "Light of Change," Advice From Intel CEO Brian Krzanich". San Jose State University. Spring–Summer 2017. Retrieved September 8, 2017. ^ a b c d e Palmer, Annie (August 8, 2017). "Intel CEO Brian Krzanich Reveals Some of His Best Leadership Tips". TheStreet.com. Retrieved September 7, 2017. ^ Palmer, Annie (August 8, 2017). "Here's What Intel CEO Brian Krzanich Thinks About the Powerful Tech Stock Rally". TheStreet.com. Retrieved September 7, 2017. ^ Seifert, Dan (May 2, 2013). "Who is Brian Krzanich, Intel's new CEO?". The Verge. Vox Media. Retrieved September 8, 2017. ^ a b c Heater, Brian (August 15, 2017). "Intel CEO Brian Krzanich will discuss the future of artificial intelligence and more at Disrupt SF". TechCrunch. Retrieved September 7, 2017. ^ Ryssdal, Kai (October 1, 2014). "Intel CEO Brian Krzanich on 'silicon leadership'". Marketplace. Minnesota Public Radio. Retrieved September 11, 2017. ^ Novet, Jordan (January 5, 2016). "Every Intel product will feature a 'conflict-free' label starting in Q2 2016". VentureBeat. Retrieved September 21, 2017. ^ Toor, Amar (January 9, 2014). "Can Intel break our addiction to conflict minerals?". The Verge. Retrieved September 21, 2017. ^ Gunther, Marc (January 13, 2014). "Intel unveils conflict-free processors: will the industry follow suit?". The Guardian. Retrieved September 21, 2017. ^ Suskind, Alex (May 31, 2016). "How New Doc 'Merci Congo' Sheds Light on Deadly Conflict". Rolling Stone. Retrieved September 21, 2017. ^ "What Can Ease the Conflict in the Congo?". Rolling Stone. Retrieved September 21, 2017. ^ Buckley, Sean (January 5, 2016). "Everything Intel ships this year will be conflict-mineral-free". Engadget. Retrieved September 21, 2017. ^ "Intel CEO joins Deere board". The Waterloo-Cedar Falls Courier. Waterloo, Iowa: Lee Enterprises. January 6, 2016. Retrieved September 11, 2017. ^ a b c Chandran, Nyshka (August 14, 2017). "Intel CEO Brian Krzanich quits Trump's manufacturing council". CNBC. Retrieved September 7, 2017. ^ Bradshaw, Tim; Murgia, Madhumita (March 13, 2017). "Intel joins Silicon Valley's race into self-driving cars". Financial Times. ISSN 0307-1766. Retrieved September 8, 2017. ^ Ernst, Douglas (June 1, 2017). "Intel CEO sees self-driving surveillance vehicles in America's future". The Washington Times. Washington, D.C. ISSN 0732-8494. OCLC 8472624. Retrieved September 8, 2017. ^ Miller, Michael J. (June 2, 2017). "Krzanich Says Intel is Not a CPU Company Anymore". PC Magazine. ISSN 0888-8507. Retrieved September 8, 2017. ^ Palmer, Annie (August 8, 2017). "Intel CEO Brian Krzanich: We're Still Paranoid About the Competition". TheStreet.com. Retrieved September 7, 2017. ^ Condon, Stephanie (August 16, 2016). "IDF 2016: Intel CEO Brian Krzanich unveils Project Alloy". ZDNet. CBS Interactive. Retrieved September 11, 2017. ^ Quicke, Simon (January 5, 2017). "Intel boss promotes the business prospects for VR". Computer Weekly. TechTarget. ISSN 0010-4787. Retrieved September 11, 2017. ^ a b c McCarthy, Kieren (October 25, 2016). "That time Brian Krzanich had dinner with Elon Musk, Marc Benioff, David Blaine and Lars from Metallica". The Register. Situation Publishing. Retrieved September 7, 2017. ^ Fried, Ina (June 2, 2017). "Intel CEO sees VR sports as a billion dollar business". Axios. Axios Media. Retrieved September 8, 2017. ^ a b c Pressman, Aaron (June 2, 2016). "Intel CEO Tries to Quiet Criticism After Cancelled Trump Fundraiser". Fortune. Retrieved September 7, 2017. ^ a b Wingfield, Nick (January 6, 2015). "Intel Allocates $300 Million for Workplace Diversity". The New York Times. The New York Times Company. ISSN 0362-4331. OCLC 1645522. Retrieved September 7, 2017. ^ Guynn, Jessica (January 6, 2015). "Intel pledges diversity by 2020, invests $300 million". USA Today. Gannett Company. ISSN 0734-7456. Retrieved September 11, 2017. ^ Dean, Takahashi (January 5, 2016). "Intel updates its diversity fight with a pledge to combat online harassment". VentureBeat. Retrieved September 11, 2017. ^ Newton, Casey (August 14, 2017). "Intel CEO Brian Krzanich is stepping down from Trump's advisory board". The Verge. Retrieved September 7, 2017. ^ Rogoway, Mike (January 30, 2017). "Intel CEO denounces Trump's immigration order: 'This is not a policy we can support'". The Oregonian. Retrieved September 29, 2017. ^ a b Mullen, Jethro (August 15, 2017). "Intel CEO is the latest to leave Trump's manufacturing council". CNN. Retrieved September 7, 2017. Swanson, Ana (February 8, 2017). "The unanswered question in Trump's announcement of a $7 billion Intel investment". The Washington Post. ISSN 0190-8286. OCLC 2269358. Retrieved September 11, 2017. Finley, Klint (February 8, 2017). "Intel's 'New' Factory Isn't About Trump – It's About Fixing Intel". Wired. San Francisco: Condé Nast. ISSN 1059-1028. OCLC 24479723. Retrieved September 8, 2017. "Remarks by President Trump and Intel CEO Brian Krzanich on U.S. Jobs". whitehouse.gov. February 8, 2017. Retrieved September 8, 2017. ^ Kim, Eugene (February 8, 2017). "Intel CEO gives support for Trump tax policy in company-wide email after White House meeting". Business Insider. Axel Springer SE. Retrieved September 8, 2017. ^ Swanson, Ana (February 9, 2017). "Intel touts $7 billion chip-plant investment". The Washington Post. Retrieved September 11, 2017 – via Chicago Tribune. ^ Goel, Vindu (February 8, 2017). "Intel, in Show of Support for Trump, Announces Factory in Arizona". The New York Times. Retrieved September 8, 2017. ^ Tarantola, Andrew (February 23, 2017). "Transgender protection rollback sparks opposition from tech". Engadget. Retrieved September 21, 2017. ^ Hatmaker, Taylor (February 23, 2017). "Apple, Google and more speak out against Trump revoking trans student protections". TechCrunch. Retrieved September 21, 2017. ^ Fried, Ina (July 26, 2017). "Tech leaders speak out against Trump ban on transgender troops". Axios. Axios Media. Retrieved September 21, 2017. ^ a b Regan, Helen (August 14, 2017). "Intel CEO Brian Krzanich Leaves Trump's Manufacturing Council Citing a Toxic Political Climate". Fortune. New York City: Time Inc. ISSN 0015-8259. Retrieved September 7, 2017. ^ a b Lee, Timothy B. (August 15, 2017). "Intel CEO Brian Krzanich quits Trump manufacturing council". Ars Technica. Condé Nast. Retrieved September 7, 2017. ^ Rogoway, Mike (September 6, 2017). "Intel's CEO says he stands with 'Dreamers,' calls on Congress to act". The Oregonian. Retrieved September 21, 2017. ^ Sumagaysay, Levi (August 15, 2017). "Intel CEO Brian Krzanich quits Trump council after Charlottesville, accelerates diversity drive". The Mercury News. Retrieved September 7, 2017. ^ a b Herhold, Scott (August 16, 2017). "Why Intel CEO left Trump council". The Mercury News. San Jose, California: Digital First Media. ISSN 0747-2099. OCLC 145122249. Retrieved September 8, 2017. ^ Wolverton, Troy (January 4, 2018). "Intel was aware of the chip vulnerability when its CEO sold off $24 million in company stock". Business Insider UK. ^ Breland, Ali (January 4, 2018). "Intel CEO sold $24M in stock after firm knew about cyber vulnerabilities". The Hill. ^ Gallagher, Sean (January 4, 2018). "Intel CEO sold all the stock he could after Intel learned of security bug". Ars Technica. Retrieved 2018-01-05. ^ "Intel CEO Krzanich Resigns After Relationship With Employee". Retrieved 22 June 2018. ^ Salinas, Sara (21 June 2018). "Intel's Brian Krzanich is forced out as CEO after 'consensual relationship' with employee". Retrieved 22 June 2018. ^ Salinas, Sara (2018-06-21). "Intel's Brian Krzanich is forced out as CEO after 'consensual relationship' with employee". CNBC. Retrieved 2018-06-21. ^ "WSJ - Brian Affair". ^ CNBC (2018-11-07). "Ex-Intel chief Brian Krzanich joins CDK Global as its CEO". CNBC. Retrieved 2018-11-07. ^ "Information on Brian Krzanich, Intel's new CEO". The San Diego Union-Tribune. Tronc. Associated Press. May 2, 2013. ISSN 1063-102X. Retrieved September 11, 2017. ^ "Intel CEO Brian Krzanich Elected Chairman of Semiconductor Industry Association". Semiconductor Industry Association. November 13, 2014. Retrieved September 11, 2017. ^ Shahani, Aarti (February 3, 2016). "Intel Discloses Diversity Data, Challenges Tech Industry to Follow Suit". NPR. Retrieved September 11, 2017. ^ Kim, Eugene (June 2, 2016). "Intel CEO Brian Krzanich was going to hold a Trump fundraiser but suddenly canceled it". Business Insider. Retrieved September 11, 2017. ^ Sumagaysay, Levi (June 2, 2016). "Intel CEO cancels Trump fundraiser, says he's not endorsing a presidential candidate". Silicon Beat. Retrieved September 11, 2017. ^ King, Ian. "Intel CEO Krzanich Is Said to Cancel Trump Fundraiser at Home". Bloomberg Politics. Retrieved 16 June 2016. ^ Chmielewski, Dawn. "Intel's CEO planned – then scrapped – a fund-raiser for Donald Trump". Recode. Retrieved 16 June 2016. ^ Krazit, Tom (August 14, 2017). "Intel CEO Brian Krzanich resigns from Trump advisory council over concerns about Charlottesville". GeekWire. Retrieved September 7, 2017. "Brian Krzanich, Intel – Keynote 2016". Consumer Technology Association.